Thinking of exhibiting at IFSEC International 2019 but not sure? Take a look at how live events can benefit your business, often far outweighing the impact of your traditional marketing campaigns. It’s a fact. Time spent physically in front of your prospects and customers is time well spent. Download these resources to see the statistics supporting good old-fashioned human interaction and why it remains one of the biggest and fastest sales drivers for businesses like yours. Simply complete the form to access our free guide to why ‘face time’ really matters. 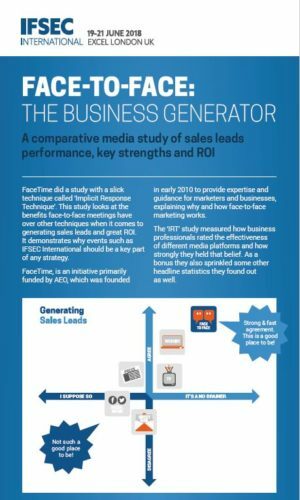 IFSEC International: Why face-to-face events are good for better business Take a look at how live events can benefit your business, often far outweighing the impact of your traditional marketing campaigns. By downloading this white paper you understand that UBM are providing you with this service, free of charge, with the explicit intent of identifying business leaders with a legitimate interest in UBM products and services for which you will receive marketing communications following submission of this form and your details. If you do not wish to continue receiving marketing communications from UBM you will be able to unsubscribe using the links provided within the communications and you will receive no further marketing communications relating to this content. If you do not wish to receive any communications from UBM please do not submit this form. I understand that I will receive marketing communications from UBM by downloading this white paper.